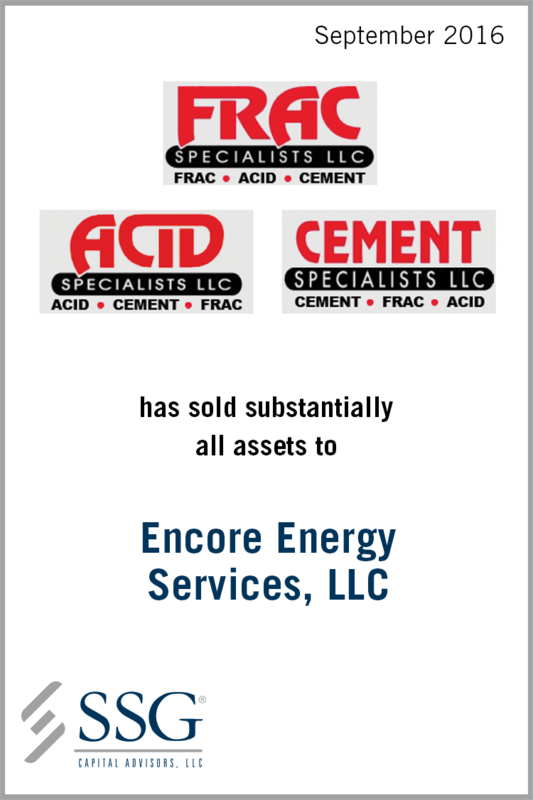 Acid Specialists, LLC, Cement Specialists, LLC and Frac Specialists, LLC (individually “Acid”, “Cement” and “Frac”, respectively; collectively referred to as the “Company”), headquartered in Midland, TX, is a provider of well site services throughout the Permian Basin. The Company’s services include acid and chemical pressure pumping, cementing and hydraulic fracturing. From 2012 through 2014 the Company experienced accelerated growth with strong financial performance fueled by an expansion of its Frac division. In order to capitalize on strong industry conditions at the time, the Company invested heavily in equipment financed through capital lease agreements. However, the subsequent and unexpected decline in oil prices ultimately had a significant downward impact on oilfield service activity. As a result, the Company’s customer base deteriorated and its liquidity became constrained leading to a Chapter 11 bankruptcy filing in May 2015. SSG was engaged by the Company to evaluate strategic alternatives to help restructure the Company’s balance sheet. SSG and the Company considered a number of potential solutions including operational initiatives, disposal of non-core assets and divisions, restructuring through a new capital raise and a sale of the Company in whole or in parts. Based on the prolonged decrease in oil prices and oilfield activity, it became evident that operational initiatives and/or new capital would not be feasible standalone solutions. As a result, the Company and its advisors concluded that the best option was a combination of (1) returning idle and underutilized equipment to capital lessors, (2) divesting of excess owned equipment, (3) implementing operational initiatives to reduce labor and insurance expenses and (4) selling the remaining core business to a going concern buyer. These initiatives enabled the Company to maximize value to the estate while preserving jobs and maintaining customer loyalty. The transaction closed in September 2016.